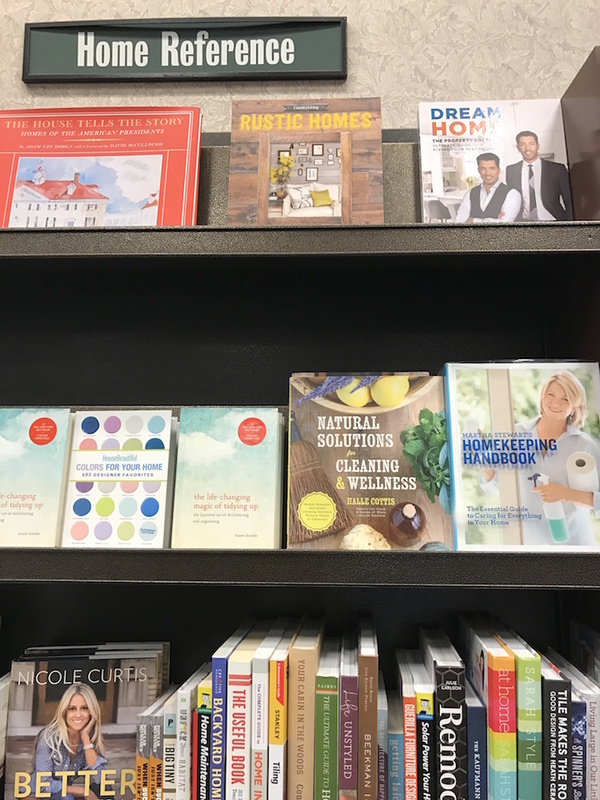 I am over the moon excited to share my new book, Natural Solutions for Cleaning and Wellness, with you! I’ve been working on this project since 2015, and today is the day that I get to share it with YOU! To celebrate, I’m giving away 3 SIGNED copies! Just leave a comment below this post on why you’d like this book or how you’d plan to use this book and you are automatically entered!! One entry per person, please. I will randomly pick three names and announce the winners on Monday, February 13, 2017 — at 12 PM EST, right in this blog post and the winners will also be emailed! Don’t wait, enter now for your chance to win a signed copy of my latest and greatest! I’ve emailed all three of you for your addresses so that I can mail you your copy. Once I hear from you I will ship it right away! « Your Simple Guide For Common Ingredients Found in Natural Solutions! I keep trying homemade cleaning recipes, only to be disappointed. I am very excited about this book. I have been slowly changing the way I eat, clean, purchase, and think about all things. This book would be a great addition to help me on that journey. I hope I win. Keep up the great work Halle. Congratulations on your book!! 🙂 I use as natural as I can get around the home but there are some things I have not yet tried. I would love to use this book to better my practices of eco cleaning and share my experiences with my family. 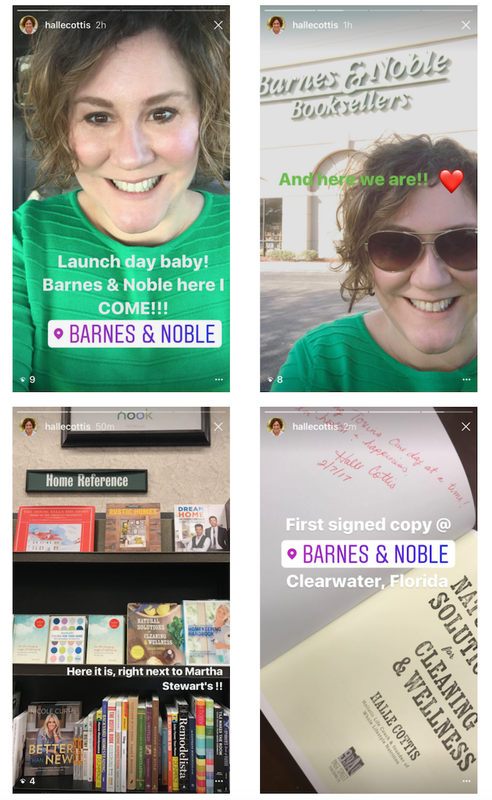 I’m already giving 2 of the 3 books I bought away as gifts, so if I win the autographed copy, I will keep it for myself–and give ALL THREE as gifts! Share the wealth, baby! ? Congratulations on seeing your book in a store! If I won a copy, I’d immediately flip to see if it covered how to clean black mold, the bane of my bathroom. Congratulations on the completion of your book. I am a retired grandmother who is participating in the care of my four grandchildren. I knew nothing about natural cleaning methods when I was raising my three boys and would love to use only natural products in my home now to protect my grandchildren ages 1 to 6. I browse the internet often looking for natural cleaning recipes (some work, some do not). It would be lovely to have a book with everything in one place. I love that you have all this information for both home and health in one guide! I’m always looking for good resources to have on hand, rather than googling these topics. I write about living a nontoxic life and a guide like this would be a great help in raising my family. I already receive your newsletter, and am a huge admirer of your way of life and tips. I would love to read and use your book to make my lifestyle healthier! I would love a chance to enter a chance to win your new cook book!! I have been folllowing your blog for awhile and love your recipes!! I am passionate about health and wellness and I am a personal trainer!! Thank you!!! Wahoooo! Congrats Halle! I’d use it for cleaning my kitchen island (made out of marble) aka hangout spot. I use it for food prep (obvs) but also for serving drinks, craft table and even ironing. There are some faint stains on there.. I am sure theres a better way to clean it. We just bought a “fixer upper” and boy does it need some “natural” tender loving cleaning care. This would be a huge blessing to me. My roommates and I have been on a journey to a healthier lifestyle but have been struggling to find the right resources. This book would be an amazing tool to help us eat, clean and be more healthy and natural in our home. Congrats on the book! I’d love to win a copy to help my further my journey of clean eating and using clean body care and cleaning products. I’ve given up most commercially produced products and felt healthier and saved money. So excited for you and us!! Our family has been moving in a natural direction for a bit now and I welcome new ideas and tips. Thanks for creating this book!! I’m always looking for more ways to increase a healthier lifestyle. Everything from eating healthier and using natural solutions for cleaning to stay away from chemicals! Hello Halle Entering your draw for your new book! I already pre-ordered mine online at amazon, but it won’t get here until mid-March. As to why I would love to get your book – I have all these printouts and scraps of paper all over my house with hints and formulas etc. and I took one look at your book and thought – Finally! Everything in one place – plus it’s all proven to work – and I can’t wait to get my hands on it and try out everything. Spring cleaning here I come! I’m a Chiropractor and am constantly being asked about natural products and solutions. This book would be a great help! I’m feeling lucky!!! This book is just what I need! I try home made products of all kinds all the time…..some work some don’t. This would be fun to try some different ones. It would be nice to have all recipes together in one place so I wouldn’t keep loosing them (which is what I do alot lol). What a wonderful giveaway!! Thanks so much!! Love homemade recipes! I already make salves,lip balms and elderberry syrups, so would love to try the cleaning recipes, thanks for the chance to win this! 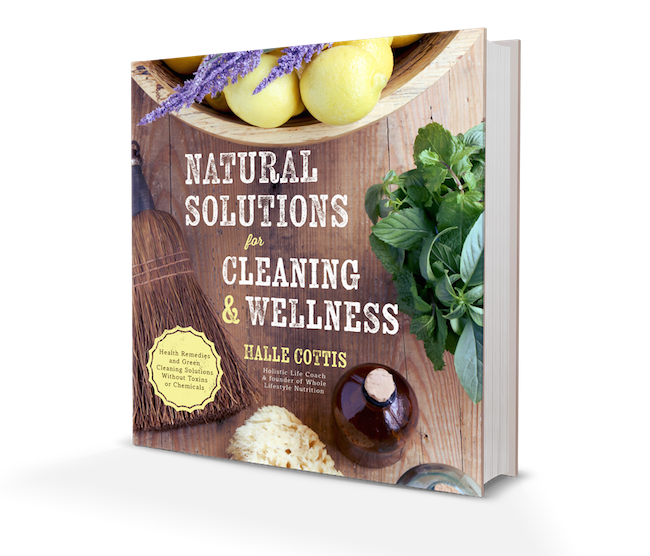 Congratulations Laura, you have been selected as one of the winners of my new book Natural Solutions for Cleaning & Wellness! I will email you here shortly to find out where you’d like me to send your copy of your new book. I’ve been trying to clean more naturally for years and would love to have your book in my arsenal!!!! I’m always looking for newer and better ways to do things. I think this book will be valuable in my quest for using natural products. I know you have proven these tips which gives me confidence to try them! So many are trying to live chemical, preservative, additive and pesticide free not only in our foods but also in products that are toxic in our homes and environment. I believe it is important to have natural ways to clean and be well. Your book will not only help, but will be a great ‘go to’ for needed solutions in everyday life. Great book! I’d love to have a reference for natural cleaning. I have 2 cats and use products that are less toxic to them, but being able to make my own would be better and cheaper. Congratulations. It would be nice to have book with all of these ideas in one place. I trust you have done all the research and have only the BEST recipes to pass along for cleaning and personal wellness, and I need that! As a mom with kids, I like to use products without harmful toxins…and am always working on a healthy body inside and out! I have read the Amazon synopsis and LOVE the simplicity of the ingredients and most of them I have on hand and could start creating right away! I would hope to find recipes I love that i can share with my kids so they can help me and be educated as well! I have struggled with health issues and know that through natural remedies that would help but not knowing where to start and what is real and what is not. I would love to have a copy of your book to help me through the process. Congratulations! I’m in need of ways to clean that don’t trigger allergies and irritation so your book sounds perfect for me. Thanks! I have all kinds of allergies and asthma. I am always looking for a better and healthier way of cleaning! I’ve tossed all the bad stuff both cleaning and cosmetics and now I’m confused on what to get! Making them sounds like the way to go. Thank you! I’ve been in the process of detoxifying my entire life: food, clothing, makeup, skin care, and home care…..this would come in handy. If I won a copy I’d definitely show it off and enjoy using it with my 3 kids during our cleaning times. As a family we always seek natural remedies to ailments so there’s no doubt we’d be using it for that too! I would so love to win this book. My husband and I have just retired and moved to a new location, our dream home. We wish to embrace a more natural lifestyle and so this book would be really helpful. I just moved into a new home and would love using this book to keep my house clean using natural ingredients. Thanks for the great website and great information! I’ve been working on changing my diet & lifestyle to be more natural & healthy. I’m also looking for more natural ways to clean my home & keep those wrinkles away! I am always striving to do things naturally…eat, bath, clean house, etc….it would be easier and healthier for me and my family to follow a trusted friend with good information than all the others out there on the market! Thank-you for allowing us to enter to win your New Book “Natural Solutions for Cleaning and Wellness”! Best of luck everyone!!! I’m thrilled to see your book is published – Congratulations!!! I’ve been working on my health in a hit or miss fashion until last week when I saw a Function Medicine doctor for the first time. While a baseline of my health is established, I want to continue ‘cleaning up’ my home. Your book will be such a great help, I hope I win! I am all about natural and healthy ways to clean my house and ideas to use on my farm! I’m trying to get rid of the chemicals in my life. This would help! I need to make some huge life style changes and I want to get healthy. I am excited to learn all I can to make that happen! I was also excited when I saw your new book on your blog!! I can’t wait to read it. I would love to win a free copy but even if I don’t I am going to buy a copy! ? Thanks for trying to help us get well by changing the way we have been doing things for years! My family has been recently diagnosed with AutoImmune, Asthma, Allergies, etc. & id love to learn how to clean without chemicals. Thank you. Greetings on this lovely day!! My name is Mary and a little over 3 years ago I was diagnosed with a rare auto immune disorder called Dermatomyositis. This disorder causes my body to attack my skin and muscles. Since the disorder was so rare it took me almost 5 years for a diagnosis, with many mis-diagnosis and unnecessary treatments along the way. It took loosing the ability to walk because my muscles shut down to get a REAL diagnosis. By that time I exhausted and had little faith in the medical profession, and was looking for ways to heal myself. It has been a delicate dance of healing for me since. My Drs advised me chemo for life was probably my only option to control this, unless my body somehow went into remission. After my own research for healing I decided to follow my gut instinct and choose a complete diet change, natural supplements and treatments. With the help of all those things I was walking again, and most of all healing in mind, body, and spirit. I have to be very careful in my choices these days. So far I have proven my Drs wrong, and they are astonished with my progress. My health and wellness required an entire lifestyle change, and it was the best thing I ever did. Cooking good things for myself soothes my soul, and makes me feel so connected to my healing. Peace & Blessing to all on a lifestyle change journey!!! I would love a copy of this book as I am trying to switch to all natural cleaning, especially since we are trying to have a baby! I want a clean and safe environment to bring a sweet little one home to. Congrats on your book! Within the last 18 months, my adult ‘college aged’ daughter has begin experiencing migraines & medical issues related to her digestive system. While many tests have ruled out the worst, some is stress related, and some is diet. So, I am constantly researching & reading; and, I am slowly revamping out entire lifestyle beginning with our nutrition to a more organic, gluten free diet and living a more natural lifestyle in order to improve her health. I signed on to your website to become educated & learn new ways. Your book sounds promising and I am interested in reading it along with reading more from you! Thank you. Trying to convince my husband why we need to ditch the toxins!!! I would love this book. It is my goal to try to live as natural as possible in all areas of my life.